Come and enjoy the amazing views of the Gulf and Bay from the balcony and both bedrooms! This recently updated property is warm and inviting. Pool, Beach Service, onsite restaurant, & too many other amenities to list. Saturday to Saturday rental during the Peak season. It was great ..the view was amazing from our 14th floor. Thank you for sharing your review for Surfside 1406. We are delighted to know that you had a great stay and that you so appreciated the amazing Gulf View! We hope to welcome you back again soon as our guest here in beautiful Miramar Beach, FL! Great location- easy access to beach. Condo was very clean and quiet and well-stocked with all you need and want for a comfortable stay. Rental mgmt staff very responsive. First time here but will be back SOON. Thank you for sharing your review for Surfside 1406. We are so pleased to hear that you all had a wonderful beach vacation stay in this beautiful condo! 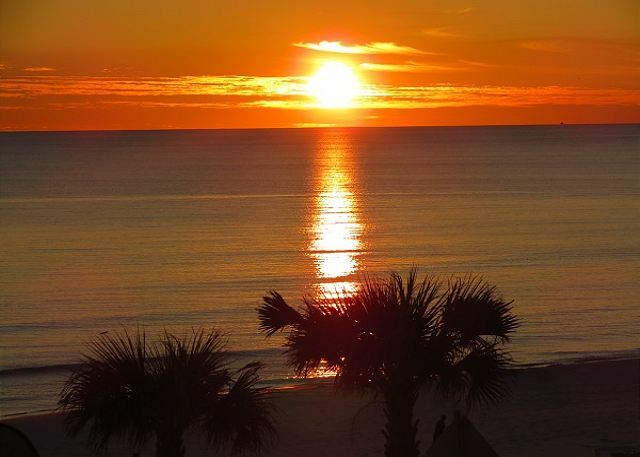 We look forward to having you all back again soon as our guests here in beautiful Miramar Beach, FL! Our family had an amazing time staying at Surfside and enjoying all of it's offerings including an easy walk to the beach, the swimming pool and jacuzzis, the delicious food from the restaurant and the bonfire on the beach. The condo itself was absolutely perfect. We loved the decor and furnishings and the location. Thank you for sharing your review for Surfside 1406. We are delighted to know that and your family enjoyed your weekend escape staying in this beautiful condo, and that you all appreciated the great amenities that come with this great location, as well as the great features and design of this particular condo! We hope to welcome you all back again soon as our guests here in beautiful Miramar Beach, FL! We loved our stay. The condo was very comfortable and the view from the balcony was amazing. Thank you for your review of Surfside 1406. We are delighted to know that you all loved your stay in this beautiful home and that you so appreciated the Gulf View! We hope to welcome you all back again soon for another beach vacation stay with us here on the Emerald Coast! We were very happy when we checked into Surfside 1406 and saw the location, view, and the condo. We have already told friends about it and we will consider using this site in the future when we plan to vacation in Destin again! Thank you for sharing your review of Surfside 1406. We are so pleased to know that you all had an enjoyable stay in this beautiful home and that you so appreciated the view and the great location, as well as this gorgeous home itself! We hope to welcome you all and your friends and family here as our guests soon for a wonderful Destin beach vacation here on Florida's Emerald Coast! Thank you for sharing your review for Surfside 1406. We are delighted to know that you had a wonderful beach vacation stay in this beautiful home! We hope to be welcoming you back again real soon for another great vacation stay with us here on the beautiful Emerald Coast Beaches of Florida! We had a great stay in Surfside. The staff was helpful, the condo was clean and well stocked. The beach chairs were convenient. The weather sure helped make our stay even better. Thank you for sharing your review for Surfside 1406, and for your kind words for our team! We are delighted to know that you all had a great stay in this beautiful home and that you enjoyed the features of the home, the beach service, and the great weather too! We hope to welcome you all back again soon for another beach vacations stay with us here in beautiful Miramar Beach, FL! 2nd time staying in the room. This year was a little cleaner then last year. Great room, great location. Great place to stay for the week. Thank you for your review of Surfside 1406. We are so pleased to know that you all had a wonderful stay with us in this beautiful condo! We hope to see you back again soon as our guests in Miramar Beach, FL! It was a very nice place. We enjoyed sitting up high and looking down at the beach plus you could see way out in the water, (we wish we had taken our binoculars). It was a very relaxing place. There was no problem with the elevator, we didn't not have to wait long or it did not take long to get to the floor that you needed. We definitely would stay here again and highly recommend it. Thank you for sharing your review of Surfside 1406. We are delighted to know that you all so enjoyed your stay in this beautiful home, and that you so appreciated the amazing Gulf Views! We hope to welcome you all back again soon for another wonderful beach vacation stay with us here in beautiful Miramar Beach, FL! We loved our stay and Condo. It was clean and the view was beautiful. Thank you for your review for Surfside 1406. We are happy to hear that you all had a wonderful stay with us in this beautiful condo and that you enjoyed the Gulf View! We would love to welcome you all back soon for another Beach Vacation stay with us here in Destin, FL! This condo is well appointed and furnished with all the necessities for a great vacation.the views are spectacular! It's location was perfect for us: close to shopping, restaurants, our Church and easy beach access. Thank you for sharing your review for Surfside 406. We are so pleased to hear that you all had a wonderful stay with us and that you so enjoyed this beautiful home, and the Gulf View! We would be delighted to welcome you all back soon as our guests in Destin, FL! Thank you so much for your kind review. We truly appreciate having you all as our guests and we're so happy to know that you all so love this beautiful condo! We look forward to having you many more happy times as our guests here in Destin, FL! Overall a great week away. Pool is nice, grounds are well kept. Thank you for sharing your review. We're happy to know that you all had a great week during your Fall Break Beach Vacation! We would love to welcome you all back soon for another wonderful stay with us here in beautiful Destin! Great except for the TV's. They wouldn't go on all the time. We are 2 older ladies and missed some of our programs, especially the morning news programs. We didn't use the pool or beach. Also we think there should be hand rails in the shower and the tub. We were there for a beach wedding. Thanks. Thank you for sharing your review and suggestion. We appreciate having you all as our guests and we are glad you had a great stay with us at Surfside Resort! We do apologize for any difficulties with the televisions, and we hope that you all were able to contact our office so that we could assist you. We are always available to assist our guests so that each guest can have a relaxing vacation stay with us. Please let us know when you're booking your next stay with us, that you prefer a home with the hand rails in the bathroom. We would be more than happy to help you select the home that is perfect for you. We would be delighted to welcome you all back soon as our guests on the Emerald Coast! This was our first vacation to Destin & we loved it! The condo was absolutely wonderful, it had everything we needed and we loved the private access to the beach. There were 5 of us and it fit us very comfortably. The view from the balcony was pretty awesome too. Easy check in & check out, condo was in a great location. The only negative thing I would have to say would be the elevators were extremely slow, but that wouldn't keep us from going back! Our kids are already saying that is where they want to go next summer also! Would definitely stay at this condo again! Thank you for sharing your review for Surfside 1406. We are happy to know that you all had a wonderful vacation stay with us in this luxury condo and that you enjoyed the private beach, the Gulf view from the balcony as well as the location of this home. 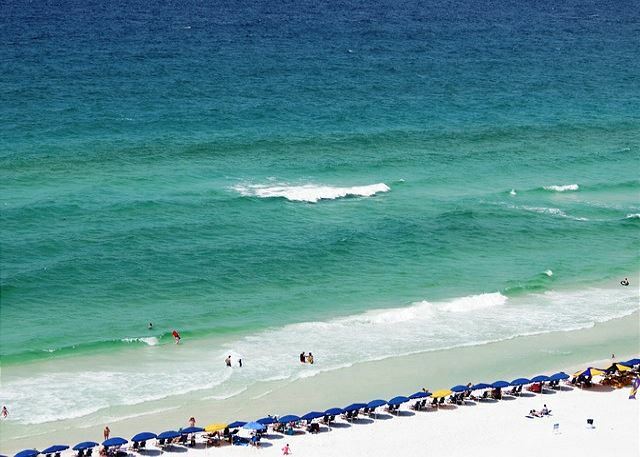 We look forward to having you and your family back soon as our guests at Surfside in Destin! Beautiful unit with a great location!! We had a little misunderstanding with the beach service which Harmony took care of immediately!!! The beach service was very pleasant and extremely accommodating. We've stayed in Harmony rentals for the past 5 years and won't stay anywhere else. Thank you for sharing your kind review. We're so pleased to hear that you all had a wonderful stay with us at Surfside 1406 and we're happy that we were able to assist with beach service. We very much appreciate having you all as our guests over the years and we look forward to have you all back real soon as our guests in Destin! We thoroughly enjoyed our stay at Surfside! We come to Destin every year and have stayed in a variety of places - this might be one of the best! Very convenient location with direct access to beach. Very clean, and the condo itself was beautiful! Will definitely stay here again! Thank for sharing your review. 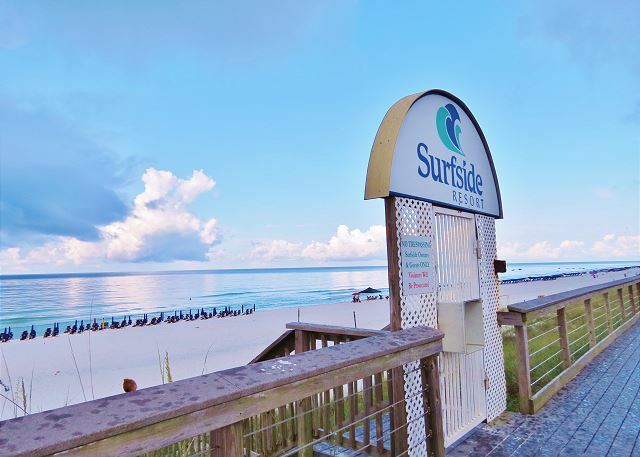 We are pleased to hear that you all enjoyed your stay with us at Surfside 1406 in Destin, FL! We're glad that you enjoyed the easy beach access and the great location of this beautiful home. We hope to have you all back soon as our guests in Destin! This unit was super nice! The pictures don't do it justice. The only complaint I have is that the tile floors need a good mopping. The bottoms of our feet would get black walking barefooted. Overall, the condo was clean and felt very homey, unlike others I have stayed in. Most are decorated with cheaper furniture that isn't comfortable. This was one was very nicely furnished and the beds were comfortable. The view from the patio is spectacular and it's a large patio with plenty of furniture. In the closet we found a seat for a small child to eat in. There is also a small step stool and potty chair. They thought of a lot of little things that make your stay wonderful! Had plenty of extra blankets, pillows, throws and towels. We were very pleased and will stay again if we go back. Harmony Beach Vacations, Inc. was a dream to go through. Wonderful communication! Thank you for sharing your review. We're so pleased to know that you all enjoyed your stay with us at Surfside 1406! We are happy that you enjoyed the Gulf View and the furnishings of this luxury condo. We hope that you were able to contact us with any housekeeping issues, we're always available to our guests to do everything we can to make your stay completely worry free. We look forward to having you back soon as our guests at Surfside! We appreciate you taking the time to share your review and we are delighted to hear that you so enjoyed Surfside 1406! We would be happy to welcome you back soon for your next Destin Getaway! This condo was clean, very modern, everything worked well and overall was just gorgeous. It had beautiful views from the balcony, Me and my family could not have asked for a better place to stay. Thank you for sharing your review. We are very pleased to hear that you all had such a wonderful stay with us and we would love to welcome you and your family back soon as our guests at Surfside 1406! We thank you for taking the time to share your review. We're so pleased to hear that you and your family had an awesome experience at Surfside 1406 and that it felt like home to you all. We would love to welcome you back soon to your home away from home here at the Beach! The condo was a nice size and was very clean and comfortable. It had pretty much everything you would need to make a meal instead of eating out all the time. The view was great, the staff was very friendly and it was very conveniently located across from the beach. We were also pleasantly surprised that it had private beach access and service. We would definitely stay here again. Thank you for sharing your kind review. We are so pleased to hear that you all enjoyed your stay at Surfside and we would be delighted to have you back soon as our guests at the Beach! My only negative comment would be regarding the beds. The 2 full beds were very worn, when you sat on them you bounced alot. Thank goodness the teens slept on those. The king bed in the Master was alot better. The room was clean, and very well stocked. It had everything you would need on vacation, including corkscrew, bottle opener, and lots of cookware/utensils. We did not look for something we couldn't find. The use of the beach service was nice. Thanks Harmony! Thank you for sharing your kind review. We are so delighted to hear that you all enjoyed this beautiful condo with the Gulf View, as well as the complimentary Beach Service! We also appreciate your suggestion, and we do forward our guests' feedback to homeowners so that they can consider this when making updates. We hope to have you all back real soon as our guests on the Emerald Coast! Never knowing what to expect when booking from online pictures, we can say we were completely satisfied with our stay at 1406 Surfside. Spot on decor, equipped nicely, great gulf view, but most importantly VERY CLEAN!!! Thank you for sharing your kind review. We are pleased to hear that you all enjoyed your stay with us and we would love to welcome you back soon as our guests in Destin! We find the staff of Harmony Beach extremely friendly,helpful and supportive.Overall, the condo we rented was comfortable ,nicely decorated and well equipped .We enjoyed the amenities provided by our complex. Thank you for sharing your kind review! We have enjoyed having you as our guests and we look forward to having you back again 2017, or come on down anytime! Thank you for sharing your kind review! We are so pleased to have you as our returning guests and we are delighted to hear that you all enjoyed your stay with us in this beautiful home! We welcome you back as our guests anytime! Room was clean overall, great view. Overall it was a great stay, room was clean and in a great location. I would recommend, property was clean. The only issue we had was a security lady on site was rude. Other than that our vacation was super!! Everyone at Harmony was very helpful and pleasant. Thanks and hopefully we will see yawl next year. Stay was above our expectations....especially the room itself! Will be back for sure!! Getting checked in was very frustrating. My instructions that I received via email told me to check in on Thanksgiving day at the Harmony Beach office. I arrived at the office at 9:30 that morning and saw a note on the door stating that the office was closed due to the holiday. I called the phone # and had to wait forever. Finally got someone that told me they would have to call me back. I tried to call back several times between 12 and 2 and was on hold for an extremely long time 20+ minutes and eventually hung up. I finally received a return phone call around 2 pm advising that I should have been given the lock box code that was outside the office so I went back to the office to retrieve the rental keys from the lock box. Besides the frustrating check in process, everything else was fine. The condo, amenities and building are very nice. The location is right across from the beach. This was our 2nd stay at this specific condo. The condo was great and the décor was awesome! Thoroughly enjoyed our stay! Thanks Harmony Beach! Thank You! We are so delighted that you all enjoyed your stay and we look forward to having you back soon! This condo was like home.... The overall condo and Surfside facilities was wonderful! We definitely will be back! The room was very nice and clean. I Loved everything about our stay and would defiantly go back!! !